September 7, 2018, Miami, Florida – Barry University students, faculty members, and staff will continue their support for the resettlement of refugees in the 2018-2019 academic year, rolling out the welcome mat for recently arrived refugees and helping them settle into their new community. During Church World Services (CWS) Miami Family Service Days on Saturdays, October 20, 2018, and February 9, 2019, Barry Service Corps Fellows and other students will facilitate sports and recreational activities for refugee children and provide parents with information about the U.S. higher education system. Miami Family Service Days are hosted by Barry’s Center for Community Service Initiatives (CCSI). A global humanitarian nonprofit organization, CWS is a U.S. refugee resettlement agency. The CWS Family Day activities will be the main feature of the CCSI-organized Saturdays of Service planned for the fall and spring semesters. Over the past three years, Barry students, faculty, and staff have supported CWS Miami in welcoming refugees and helping them acclimate to the community. Supported by faculty and staff, students have assisted with CWS Miami Family Days and Thanksgiving celebrations for refugee families from countries such as Afghanistan, Colombia, the Congo, Eritrea, Iraq, Pakistan, and Somalia. Students have also helped refugees move into homes and navigate Miami area bus routes. Immigration is one of the key issues that the Adrian Dominican Sisters, Barry’s sponsors, address by taking a corporate stance. As a Congregation, they welcome immigrants, as do their sponsored institutions. 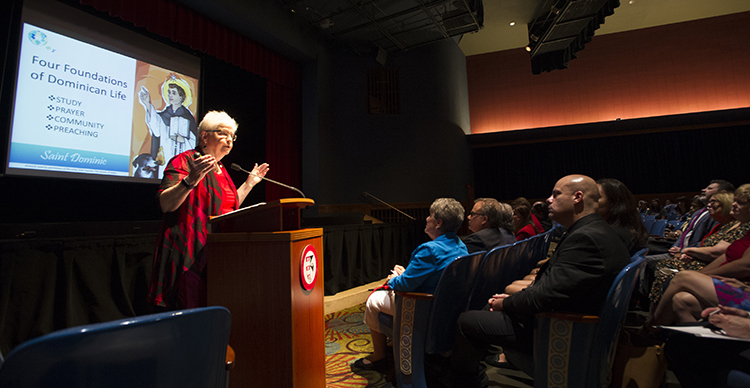 Sister Patricia Siemen, OP, Prioress of the Adrian Dominican Sisters, emphasized support for immigrants during a presentation at Barry’s Opening Assembly on August 16. “Welcoming and including the stranger, the other, is a litmus test of the Gospel and of being Dominican,” Sister Pat said. “That’s why our Catholic, Dominican institutions can and do stand clearly on welcoming immigrants, for example. For us, this is not a political issue; it is one of the foundations of our faith tradition.